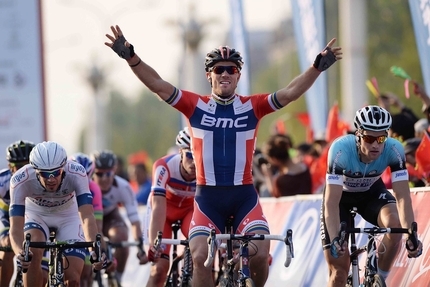 Thor Hushovd of BMC continued his comeback season with a win in Stage One of the Tour of Beijing. The 35-year-old Norwegian showed the speed which once made him a top sprinter, beating relative youngsters Michael Matthews (Orica-GreenEdge,) Luka Mezgec (Argos-AShimano,) and Alessandro Pettachi (Omega Pharma-Quickstep,) another older sprinter showing he can still get it done. Hushovd, riding for BMC, waited when Pettachi led out the sprint. Matthews chased and caught Pettachi, then Hushovd accelerated, catching Matthews and Pettachi who ran out of wind. Mezgec made a late charge and nearly caught Hushovd, finishing second. “I kind of surprised myself,” Hushovd told Universal Sports after the race. “I had a hard couple of weeks after the Worlds, finding the motivation. I still did the training I had to do and so to win here couldn’t be better. That break, of five riders, took off at the start and lasted about 180 km. Then Sander Cordeel (Lotto-Belisol) took off alone, but was caught five km from the finish. The sprinters’ teams then took over; Cannondale took an early lead but was squeezed aside by Orica. Orica fell apart in the last several hundred meters, and Hushovd capitalized on the chaos. Hushovd won the UCI World Championship in 2010, and had a good year in 2011, winning three stages in the Tour de France and wore the leader’s yellow jersey for eight days. 2012 was a lost year, with illness keeping him from competing most of the year. Hushovd started strong in 2013, with a win in the Tour du Haut Var in February, but didn’t have any good results until the Norwegian national road race championship in late June where he scored a win and a second in the time trial. He followed up with stage wins in the Tour de Pologne, Norway Arctic Race, and Tour of Austria. Beijing was his ninth win of the season. Stage Two should be another sprint finish. After that, Hushovd will likely have to hand the leader’s jersey to another rider. Stage Three includes seven categorized climbs, four Threes, two Twos, with a Cat One in the middle. Stage Four will be even harder, with a Cat One and Two in the middle, a Cat Three, and a Cat One summit finish. Stage Five is short (117 km) and absolutely flat, so Thor might have a chance to grab another win. Hushovd was realistic about his chances to keep the lead. “At least we’ll try and keep the race lead tomorrow but then there are two hard stages; we’ll see what happens,” he said.